Just about every country person kept a pig or two in Tudor times. Unlike other farm animals, cattle and sheep, the pig doesn't need a field and acres of grassland to live on. 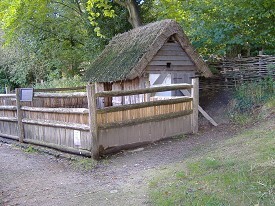 The peasant's pig would have been kept in a small enclosure behind their cottage - the hogbog! The pig needed more food than just the leftovers etc, and the peasants had rights to take their animals onto common land to graze or into the landowners woodland. 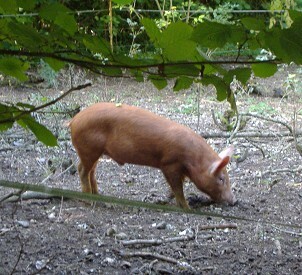 Grazing pigs in woodland is beneficial to both. The pigs grazed on the undergrowth of plants, keeping the land clear of unusable plants so all the goodness in the soil could be used by the trees, and they also added richness to the soil by manuring it. Acorn harvest is a favourite time with pigs. If the woodland was used for coppicing, as in hazel for fencing etc, the pigs would be kept away from the coppiced area for a year or two until the new growth had hardened off and developed a bark, to prevent it being eaten with everything else. A peasant would buy, or be given as part payment of wages, a young pig in the spring; which would then be fed and fattened up until autumn. This was the traditional time for killing the pigs, they were well grown so there was no point keeping them over winter - except for the breeding sows and a boar - particularly as free food in the woodland was hard to come by. The meat was cured, either by salting or smoking, to preserve it in a time when there weren't any fridges and freezers! Properly smoked and hung, joints of pork would keep well for up to two years. Pork was the main meat of the peasant in Tudor times. There is very little waste from the carcass of a pig. The saying goes - You can use every part of a pig apart from it's squeak!!! The Tudor pig was nearer to the wild boar in looks than our very round pink pigs of today. The Tamworth, a beautiful, long bodied, ginger pig and rare breed of today, is about the closest we have in looks to the Tudor pig. Even the bristles were used for brushes! Note in the photo of the pigpen below that not only does it take up just a small area, but there is a penthouse suite in the roof for the chickens to roost each night out of harms way of foxes and the like. Sheep were very important in Tudor times. They gave wool, milk, more sheep, and meat. Wool was the material that everyone worn, and the quality of English wool was famous all over the known world. It was exported to the Lowlands, where it was spun and weaved into very fine cloth and imported back to England. 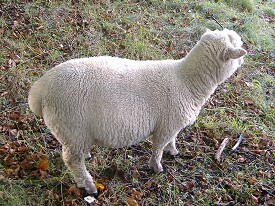 Sheep were relatively low maintenance on a farm. They didn't need the top quality grazing of the cattle, they were hardy enough to stay out all year round, just brought down to lower more sheltered land in winter, a shepherd could tend a large flock, and they gave more produce than just the wool. A ewe will have one or two lambs each year, keeping the flock going, even increasing it. The Tudors used more sheep's milk than cow's milk, only a little for drinking for the very young, very old or sick, but it was made into butter and cheese (a large part of the ordinary persons' diet). Only the very rich would have young, male lambs slaughtered for meat, most people kept their sheep for the other products until they were older and cooked and ate mutton. Although Most of us have grown up imagining Tudor farmland was worked by mighty horses like the shire this was far from the truth. Here in Britain all our native breeds are classified as ponies, and despite being very strong as riding animals they are not built to pull ploughs. We have the New Forest, Dartmoor, Exmoor, and Welsh Mountain ponies, the Fell, Dales and Highlands, with the Connemara in Ireland, are bigger and stockier, but the furthest north is the tiniest, the Shetland. Most are capable of carrying a man's weight, and are good driving animals, but none of them would be able to do all the farm work as successfully as the oxen. Our heavy horse breeds were brought in from the continent, countries like France and Belgium supplied horses for our knights, built to carry enormous weights. Again the horses that became our farm powerhouses came from the continent, but only the very rich kept horses for work on their farms. A team of horses can work faster than a team of oxen, but have many draw backs. Horses are more expensive to buy. Horses need better grazing to keep in tip top condition to work. Horses need to be kept in shelters in the winter and therefore require feeding - not something the Tudor farmer would want to do. Horses can't work on the steep slopes or heavy ground that oxen can. 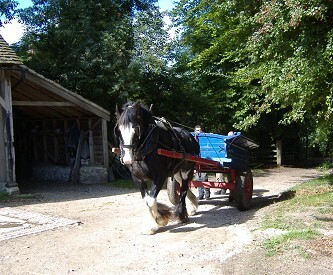 Horses provide work and nothing else, unlike the oxen. Today we have two very distinct types of cattle. There are the beef cattle, bred for their shape, and quality of meat; and there are the dairy cattle, bred for their milk production. In Tudor times cattle were working animals. Farmers did not keep big herds of them, either for their milk or meat. The working oxen, generally a castrated male, was kept to pull the plough, harrow and other farming tools. Enough were kept on a fair size farm to have a few breeding cows to keep the team going. The excess milk from these was made into butter and cheese, and a small amount for the very young, very old and sick to drink. Smaller farms may well have shared a team of oxen for the work. They say that a team of two oxen and their ploughman could plough an acre in a day. Many Tudor fields were roughly this size. Modern machinery, like combine harvesters, couldn't work in such a tiny field, getting round the tight corners, so fields have increased in size in the last century. In the same way it wouldn't have been any good the Tudor's having the field sizes of today, you wouldn't have seen your ploughman and team for about three weeks, and by the time he'd finished harrowing the field the weeds would have grown, and he'd have to start again! The oxen are very distinctive from today's cattle, built to pull a plough, with big shoulders and horns. A farmer wouldn't have kept cattle for milk or meat, because neither was used on a regular basis in the diet, as they are today. Cattle need more space per cow than sheep, they need a certain amount of shelter in winter, sheep don't, and to work they need their diet supplemented, at least with hay - dried grass. Despite this they were still much better value to the farmer than a horse. As well as work, cattle would give the Tudor farmer milk. The cattle would give horn, heated and shaped to make spoons and drinking vessels, and spices were kept in hollow horns with linen, dipped in melted beeswax, as a cover. They were bred to give the next generation of the working team. At the end of their working life the meat was eaten and their skin turned into leather. All in all a very useful animal! 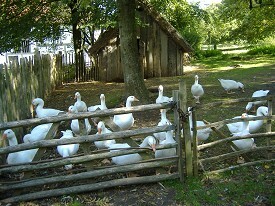 The landowner and gentry would keep geese, and these would be eaten at feasts. To run geese in your orchard was good organic gardening practice. Geese are great at pest control, eating slugs, snails and aphids; and they'd also fertilise as they moved around! 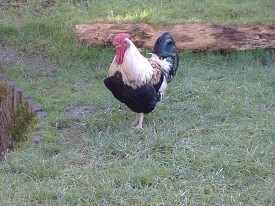 Many of us today use pelleted chicken manure on our flowerbeds. The gentry would have had dovecots in their courtyards, a great delicacy was squab, or young dove. Heaven help the peasant caught taking the master's doves for his pot! Like pigs, just about everyone would have kept chickens. Not to be fattened and eaten young and tender as we do today, but to produce eggs, practice pest control in the garden, and then eventually to be eaten. There were also many wild birds that found their way into the cooking cauldrons. Pheasant for the wealthy, and smaller birds like blackbirds for the poor. The nursery rhyme line of "four and twenty blackbirds baked in a pie" meant just that!